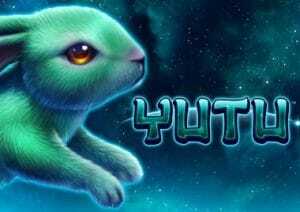 Loosely based on the Chinese folk tale about a rabbit who lives on the moon, Yutu is a 5 reel, 50 payline video slot from Playtech. Well designed as usual, the highlight here is the feature round that awards up to 15 free spins with an extra wild added to the reels after each of them. Play this simple game on your PC, tablet or mobile from between 50p and £500 per spin. With a star-packed night sky in the background, you’ll see the usual lower value royal symbols spinning around the reels. They’re joined by a selection of exotic fruit, a monkey and a fox, both of which offer payouts of up to 6 times your total bet per payline. The most rewarding symbol is the rabbit. Land 2, 3, 4 or 5 of these and you’ll pocket a payout of 0.1, 1, 4 or 10 times your total bet. Helping you to create those winning combinations is the golden crab which is the game’s wild. This can land anywhere on the reels apart from reel 1. It doesn’t offer any pays in its own right but it does substitute for everything else bar the scatter. Yutu comes with a single feature round. The Free Spins feature is triggered by landing 3 of the scatter (the rabbit in the moon symbol) on the same spin. After a payout of 4 times your total bet, you’ll be awarded 10 free spins. So far, so standard. What makes this round potentially more exciting are the wild extras. After each free spin, 1 wild symbol is added to reels 2, 3, 4 or 5. By the end of the round, the extra wilds can make a big impact, especially if you manage a re-trigger which adds 5 extra free spins to your total. Playtech has kept things pretty simple in Yutu. The design is nicely done as per usual. The soundtrack bounces along too but doesn’t seem to fit the theme very well. The action is similarly straightforward. You won’t find a huge range of extras here. The gameplay is pretty stripped back. It can explode into life at the end of the feature round thanks to the extra wilds. That simple gameplay might be a little too simple for some tastes. If you want an easy to play game that comes with just a hint of Chinese mysticism, then Yutu is worth investigating – you can also win 1,000 times your bet on every spin/free spin. If you want a bit more variety in your gameplay, Playtech has lots of options with The Dark Knight Rises and Grease (both based on films) ones to play.